Hello, my name is Ralph Edwards. Originally, I'm from a small country town in Utah. 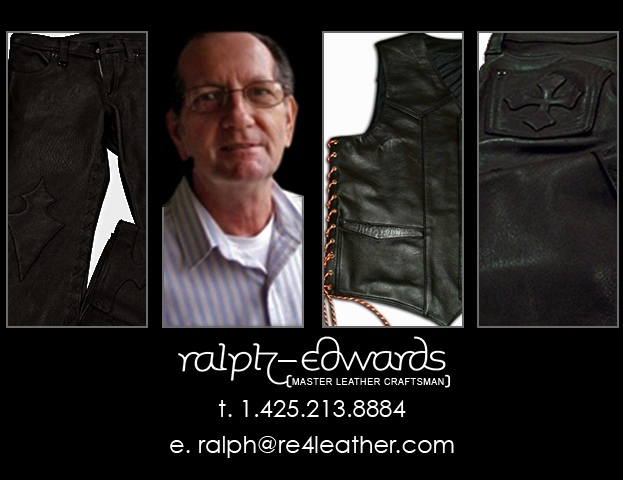 I began working with leather over fifty years ago. I was but a small framed boy of twelve, always hanging out at my Uncles Tack Shop where I gained a true knowledge and love for being a Leather Smith. Repairing, saddles and cowboy gear was where I began. I remember getting such a joy and pleasure out of working with each and every customer, as I still do today. Throughout the years, I've mastered the arts of the leather trade and can make everything from saddles, bags, tooled purses, wallets, belts, biker gear, saddle bags, chaps, vests, coats and my own original things such as leather clocks, picture frames, and jewely boxes . I now live alone and this newly started business is my main retirement plan for the future. All my work is custom, designed and fashioned to the fancy of each customer. Thank you so much for viewing my website, each page has lots of new images for you to explore. I look forward to an opportunity to work with you sometime in the future.